2:00 Yoga taught in chemotherapy infusion suites, bedsides, waiting rooms, and for their carers. Yoga is available during diagnosis, treatment, survivorship and end of life and for caregivers. Would like to have yoga available during diagnosis and prevention of cancer. Yoga is good for stress management and decreases stress hormones. Yoga teaches body awareness and promotes a healthy lifestyle, a person can take control thru mind-body practices. 4:17 Yoga for Cancer Research: working with the medical profession. Originally started with yoga for the special child. Became a caregiver for family members with cancer. Began practices with mother who was hospitalised. Then found YCAT training. 5:41 Not trained as a medical progession but mentor was a nurse. Sandra accompanied her mentor to conferences and research meetings. She made connections and started building relationships. Her mentor told her that no yogis were not medial professionals but we should stand in our own expertise. Through relationships and connections, became part of a medical team. Must respect all members of the team for their expertise. 7:35 Sandra is involved in current research of yoga for women with breast cancer with or without lymphodoema. The research has not finished yet so no outcomes. They are measuring pain, psychosocial and emotional elements. Finding if yoga is helpful for those with lymphodoema. Will be finished in June. 8:33 No consistent response to cancer. Everyone’s journey is different. First evaluation very important to listens and meeting them where they are. Where they are with regard to their cancer treatment. 10:16 Foundation of work is building a relationship with person. Questioning/listening helps them clarify their thoughts. YCAT classes structure: awareness practice to begin to notice physical, emotional, thoughts, energy and breath. Very empowering to understand what the body and mind are feeling. They learn to check in with themselves. Learn tools to help them. 12:18 Provide yoga for the caregivers. – yoga empowers them to take care of themselves while caregiving. Educating caregivers to take a break; give them a yoga practice if they like. Learn what they need and how to give that to themselves. Creating relationship with someone so that each caregiver finds exactly what they need for self-care. Supporting someone in finding out what they need. 15:37 YCAT is based in Integral Yoga. Integral Yoga Class and YCAT class structure: awareness, asana, breathwork, yoga nidra, meditation. Dean Ornish based his work in Integral Yoga for improving heart disease and chronic conditions through a healthy lifestyle. Joy Devi did a lot of research in this area to show the benefits of yoga for heart disease and chronic conditions. 17:46 The YCAT founder died in 2017 and Sandra took over as director. YCAT as an organisation decided to include more grief training in their organisation and their training. YCAT curriculum helps with grief by recognizing and having people explore their own grief in there experiences.Someone who has received a cancer diagnosis feels grief over their old life. Their new life will be very different. People with the diagnosis need to be aware of how this affects them; it could be very different from person to person. Honoring each person’s process of grieving. YCAT offers support; but must accept where each person is. Can have hard discussions about loss if person is ready and wants to talk. 22:20 Future of YCAT: Sandra is starting to work with other providers of yoga for cancer training and IYAT to establish a set of guidelines for yoga for cancer training. YCAT is positioned as continuing education after receiving 1000 hour yoga therapy training. YCAT is also promoting mentoring for teachers. YCAT supports new teachers as they find the area in yoga for cancer – they learn about themselves and self-care. Trainers model self-care. And also thinking how to provide support for health care workers. 6:00 Min-body practice defined by National Center for Complementary and Integrated Health. Many kinds of mind-body practices that you can do yourself. Mind-body practices are strategies for self-care. Treatment can be passive like drugs or give people the tools for self-care like a yoga class. Changing the way we live by using self-care tools. 8:00 Research: clinical experience and personal perception. Yoga works because we can see the benefits for students, clients and ourselves. Research aims to reduce the personal perception bias. Yoga also is aware of being able to tell the difference between one subjective experience and and our objective reality. Our decisions must be informed by both to make decisions. Expert opinion (training, gurus, etc. ), clinical preference (client’s need), and generalisable evidence from well-designed research studies. The third one is viewed most strongly by decision and policy makers. Yoga research conducted with modern health research guidelines is fairly new. Last few decades yoga research was not funded resulting in very small studies that showed promising results. They indicated that yoga was safe to do. These original studies brought research funding to yoga to now do research with rigorous design. Dose (how often), style, poses, comparison with other modalities are now part of yoga research. Results from 1 research study is 1 piece of a 1,000 piece jigsaw puzzle. It is difficult to really understand if yoga is beneficial from that one study. But a thousand studies brings the whole picture and much more confidence in yoga’s benefits. Tips to help someone who is unsure on how to review research studies. Read summary research – meta-analysis, systematic reviews – by an expert in the field. They will be very knowledgeable and by looking at several pieces of the jigsaw will have a better idea of what the research says about a yoga topic. 19:55 Steffany is developing Guidelines for Clinical Research. If you are writing about yoga research, these guidelines tell you what must be reported so that the research is designed correctly. Things like: yoga style, poses, modifications, time spent in each pose, etc. Without this kind of information, no one can make a recommendation for or against. 23:11 Yoga for Arthritis: developed rigorous, randomised control group structure, replicated with another population research on the benefits of yoga for arthritis. Yoga works, but that conclusion is based on how yoga is taught. Yoga is safe and appropriate for people with arthritis, decreases pain. Steffany’s research showed a 30% decrease in pain (comparable to drugs) but no side effects. Yoga can transform life, even without pain decrease. Research shows Yoga can improve quality of life, mental health and depressive symptoms. Study reports changes in the clinical assessment of joints. Received funding from Arthritis Foundation. Subsequent studies included qualitative (peoples’ stories about yoga’s effects) and quantitative aspects. (Arthritis Foundation asked Steffany to develop a DVD which is available on the Arthritis Foundation website. The Yoga for Arthritis website has additional resources. 29:18 Steffany has written a book: ”Yoga Therapy for Arthritis” that will be published December 2018. Arthritis affects the whole person; yoga intervenes on every level. Uses the Pancha Maya Kosha system to see the effects of arthritis on each kosha. It is illustrated by a series of personal stories of people living with arthritis and how yoga facilitates personal transformations. Includes a section on lots of different practices and modifications. 33:59 Anyone can suffer from arthritis: 300,000 children have arthritis is the US. Self-concept is changed by arthritis as well as movement. A participant in Steffany’s research had arthritis in her twenties and it significantly affected her life as she was a dancer and gymnast. Through yoga she came to realise she and her body could partners in dealing with the arthritis. 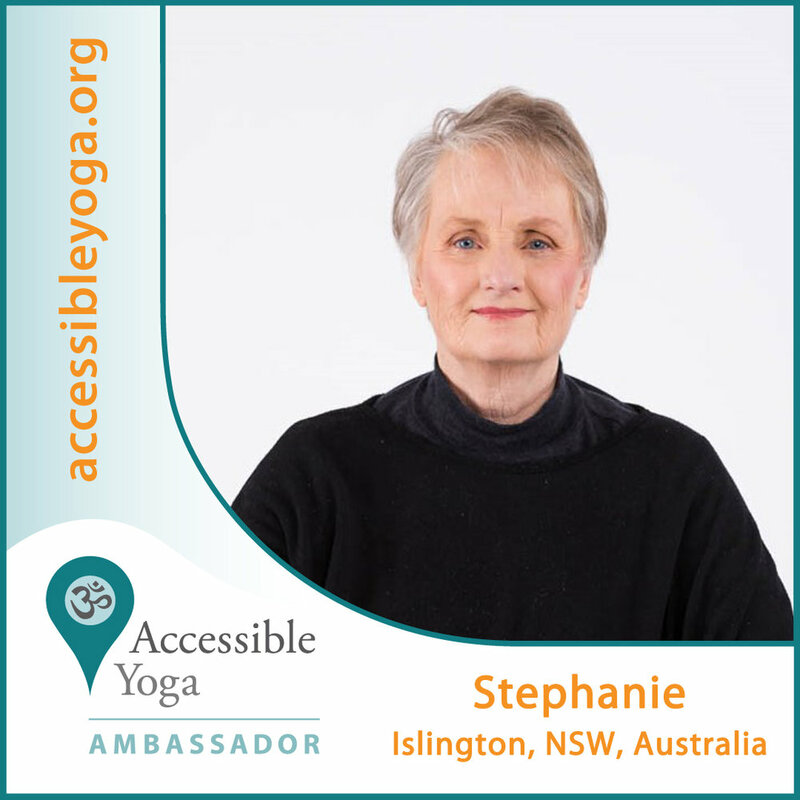 38:45 Steffany offers Teacher Training in Yoga for Arthritis. 3 Levels: 1st level – provides protocol for 8 week / 16 classes based on her research. Level 2: 1-1 mentoring for teachers, detailing how to teach. Level 3: 1 to 1 practice – yoga therapy. 42:50 Open invitation to listeners to send questions to Steffany and she will try to answer them. Introduction to Osteoporosis: bones become fragile which leads to increased risk of fractures. May be due to bone mineral decreases or the failure of the microarchitecture. Illness and drugs can also affect the bone density. 5:30 No symptoms there is a test called the DEXA test that measures bone density (but not bone microarchitecture) It tests three sites on the body: hip, vertebrae and wrist. Each site receives it’s own score. Osteoporosis: there is significant bone loss and the risk of fracture is high. Vertebral fractures can also lead to kyphosis which is 1) a risk factor for more vertebral fractures, it impacts breathing and balance. 9:59 Exercise, especially weight-bearing exercise, is recommended to move the muscles that then pull on the bones to signal the need for increased density. Axial Skeleton – skull, vertebrae, ribs. Protects the core organs and gives structure to the trunk. Women lose more bone (as a percentage) from the axial skeleton than men do so they have an increased risk of vertebral fractures. Need strong core muscles to protect the bones and to help with holding up the trunk. 11:35 Dr. Mersheed Sinaki, has done several studies on osteoporosis at the Mayo Clinic in the US. She recommends more than just weight-bearing exercise but also need to improve a) flexibility, b) core strength, c) cardiovascular fitness, d) axial strength, and e) gait steadiness (to prevent falls from loss of balance). 13:00 Yoga poses to strengthen the axial skeleton (primarily the vertebrae). Standing: With one arm on a chair if needed, lift one arm above the head with the inhale and let it come down with the exhale. Do the other arm. With sufficient strength, can use weights or lift both arms up at the same time (with or without weights). Sitting: Bring arms to shoulder height; bend elbows so hand are pointing towards the ceiling and try to press the elbows together and then release. If the student cannot bring the arms to shoulder height, then place the arms along the side and bend the elbows and then press the elbows and release. 16:45 Appendicular Skeleton: limbs, hip and shoulder girdles. Breaks in hip are often at the neck of the femur which causes a fall. Hip fractures are highly correlated with death in older individuals so a hip fracture is quite dangerous. Wrist fractures often occur when trying to stop a fall. And falls increase fracture risk. 24:30 With kyphosis, yoga can provide tools to help breathing. Need more space in the chest to allow the lungs to fully inflate. 25:25 New study correlates disturbed sleep with osteoporosis. Yoga Nidra is good for showing students how to relax and can be a tool to help them sleep at night. Or any relaxation tool used in savasana. Impact of Sleep on Osteoporosis: Sleep quality is associated with bone stiffness index, Sasaki, N., Fujiwara, S., Yamashita, H., Ozono, R., Teramen, K., Kihara, Y.
Lee Majewski has created and implements a 3 week intensive for those diagnosed with cancer. Anyone with the diagnosis, in or finished with treatment can attend the retreats. 6 years of research shows significant benefits for the attendees. 3:15 Created a 3 week Intensive Retreat for Cancer Sufferers. Based on her own experience of cancer. There is a gap in care for cancer patients in that during or after the medical treatments there is no support or resources for dealing with the effects of the diagnosis or treatments. Asana and pranayama early, yoga lecture, pranayama and meditation, restorative yoga with mudras/guided meditation, yoga nidra. Chanting. Each is developing their own practice using tools they need to help them with their cancer journey. 10:45 Lee has done research on the effects of the retreat. Attendees take standardised psychological tests the first day, the last day and 3 months after. They have recently added tests at 6 months and 12 months post-retreat. They have 6 years of data. 14:00 Attendees Benefits: given back their control and lose their victim status. Many feel fear and/or depression. The tests show marked decrease in depression over the course of the retreat. First week: getting used to the place, diet, techniques, yoga and the other attendees. Third week: Learn to manage their thought patterns. Establish their own unique practices and how to find time to do the practices daily. 23:10 Lee has also designed a chronic disease retreat based on the same organisation. 25:37 Lee is looking for other yoga therapists to help her spread these retreats to other English speaking countries and then worldwide. Yoga teacher/therapist must read the class to provide the correct tools to meet the student/clients’ needs. Internal Family Systems (IFS) combined with the yoga – asanas, breathing, visualisation, and meditation can help find the source of trauma. Movement can disrupt trauma held in the body. Have a healthy relationships with emotions like fear. Ignoring emotions stores them in the body. 2:56 Yael explains her classes for those suffering from breast cancer at Nyack Hospital. People can either be physically compromised from surgery or compromised energy from treatments. The yoga teacher/therapist should read the needs of the clients since there will be students all along the spectrum of breast cancer from diagnosis to years after treatment. 6:00 Healthy relationship with fear – Everyone has fear; fear can run you or you can have a relationship with fear. Allow yourself to feel fear (or any strong relationship), having dialogue with self about the emotion. Moving the body expresses/releases strong emotions. 8:45 Yael working with a psychologist uses Internal Family Systems (a type of therapy) based on Richard Schwartz’s work and yoga to help people and sustain change. 16:50 Recovery classes use yoga to physically feel the 12 steps as well as emotionally. 19:10 Take ourselves too seriously in yoga sometimes; need humor. 20:00 Yael contributing to “Your Shift Matters” which is based on the idea that a traumatic event can lead to transformation. 1:50 Began with corporate yoga and was pregnant while she was teaching. Some female students became uncomfortable and didn’t come to class as the baby grew. One student said it was painful to see someone so pregnant as she had had great difficulty becoming pregnant. Vinaya started studying Gynocologic Ayurveda in depth and found what the ancient teachings said about fertility Western Medicine solves symptoms, rarely the root cause. Vinaya works with clients using the Ayurvedic practices to develop a healthy uterus, some of her clients have become pregnant and had healthy babies. Birth control and infertility treatments affect the hormones in many ways and are deleterious to fertility. Pranyama is good for vata imbalances and many fertility issues are based in vata imbalances. 11:50 Vinaya likes to work with women in their 40’s because they have tried everything that Western Medicine has to offer and are looking beyond that paradigm. Western Medicine prescribes birth control pills for teenagers with heavy periods, women experiencing menopause and those with endometriosis. Long term use of birth control can have very deleterious affects on a women’s fertility. 14:45 Vinayam – a humble approach to yoga. Vinaya created this type of yoga based on specific poses for each day of the week. Each day of the week is associated with a planet in Hinduism. Each planet has different aspects and the yoga poses are chosen to support their aspects. 21:50 Vinaya’s journey from corporate yoga to fertility support. Her original training was for young people in their 20’s but her students needed a different kind of yoga. Started studying classical Ayurveda. She looked at fields where Western Medicine has few prescriptions to offer individuals like gynecology, dermatology, and obstetrics. She studied Ayurveda in great depth in these areas. Individuals need to understand the causes of their conditions/diseases not just the symptoms. 30:40 Western medicine works with fear so that people give up their body, mind and spirit to the doctor to fix. Gurus can do something similar; they want control also but use a person’s beliefs and trust. Each individual has to trust their own body, mind, spirit and find support for it to heal itself. And heredity has little effect on health, but rather the patterns of thought that have been passed down from parents or grandparents have more effect on health. 2:20 What causes stress -natural disasters, medical interventions, abuse, neglect, military related, grief and loss. 3:00 What can traumatic stress look like in a yoga class – Trauma comes in through the senses, can become stuck in the body. People with trauma stress can be hyper-aroused or hypo-aroused with little time in between. Non-traumatised people can go between these states and self regulate themselves. People with trauma cannot and can become stuck. 9:20 – What can yoga teachers/therapists do in a class with someone show trauma stress – Support them, bring them to the present, making sure they have support outside of class. 17:30 – What do yoga teachers need to know – people with trauma stress don’t feel safe or in control. Yoga class can provide predictable, safe, environment where they have choices. 24:30 Where do yoga instructors and yoga therapists fit in the healing cycle for traumatic stress: bottom up model where yoga bookends the talk therapy. Stephanie: We have a wonderful guest Rachel Zinman and Rachel was diagnosed with Type 1 l a diabetes in 2008 at the age of 42. We are talking with Katie Overcash about yoga and trauma. Katie has added restorative yoga with breathing and mediation aspects to help those with PTSD or complex PTSD. She's had great success, as evidenced by her client's feedback, some of which is included in this podcast. Katie gives tips on how to to provide a safe environment in a yoga class for those who have suffered trauma. A discussion with Rachel Zinman about the benefits of yoga for someone living with diabetes. Rachel has been diagnosed with Type 1 diabetes. She uses her personal and professional experiences to share the benefits of yoga to both Type 1 and Type 2 students.